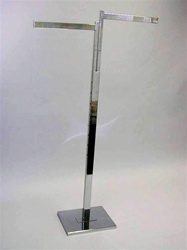 * Clear Lucite Bag Easel. * Dimensions 3"W x 7 1/2"H.
* Dimensions 3"W x 5 1/2"H.
* Dimensions 5"W x 3 1/2"H.
Individual Display Cubes Available in 6", 8", 10" and 12" Cubes. Shipping is extra and will be calculated at checkout. * Set come with 3 different size cubes. 4"H x 4"W x 4"L, and 5"H x 5"W x 5"L.
* Clear Lucite Shirt Easel. * Dimensions 7"W x 12"H.
To be used with counter top or floor base. Right Mens Glove Hand 11". This plastic display hand stands by itself and won't crack, chip or fade. Our black velvet ring display showcases 5 rings at a time. Very elegant. Our black velvet ring lug display showcases 5 rings at a time. Very elegant. This display hand is fully posable and flexible. Covered with white fabric and includes a round metal base. Great for displaying jewelry or holding other small accessories. This display hand is fully posable and flexible. Covered with black fabric and includes a round metal base. Great for displaying jewelry or holding other small accessories. * Overall Dimensions 2" x 3" x 2". * 12 Easels per Pack. This black velvet round bust is perfect for your necklace display needs. It sits low to your counter for an elegant look. 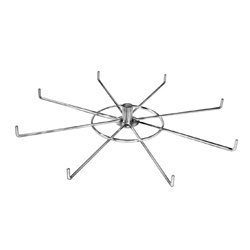 Our 4 ring hanging metal hat rack has a modern design with a black finish. Can display up to 4 hats. Our clear hanging bra display is perfect for dress up bras and athletic sports bras alike. Lucite items require special packing. A $5.00 fee per shipping carton will be automatically added to your order. * Overall Dimensions 5 1/2" x 4". * Clear Plastic and Vinyl Covered Wire Combination. * Overall Dimensions 4 1/4" x 3". * Overall Dimensions 4 1/4" x 4 1/4". 2" hard rubber industrial caster wheels with a 1" x 5/16" diameter threaded stem. For use with our box racks and round racks. 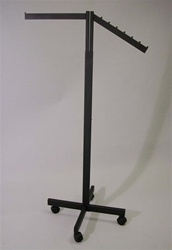 Our dome metal table top hat / wig rack has a modern design with a black finish. The metal dome at the top is designed to hold hats, wigs, and other headwear with their natural shape. 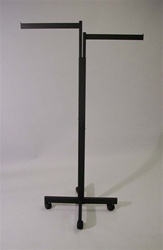 This black velvet stand up bust is perfect for your necklace display needs. It is simple and elegant. Brace bolts onto existing Double Chrome Bar Rack to add extra support if needed. * Overall Dimensions 9 1/4" x 5 1/4". Customize your merchandise display with our posable wooden hand display. The fingers are articulated for maximum flexibility. Be as creative as you can be with these wooden hand displays. Comes in a right or left hand. Our bra display is perfect for romantic bra displays or athletic sports displays. Made of lucite. Comes with standing base. 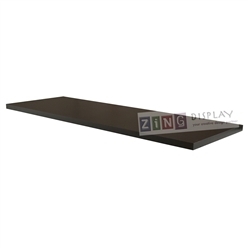 This Add-On Bar easily mounts to the bottom of the Bronze Glass Shelf (CLNWUSHLF2E) with included hardware OR easily add a hang bar to an existing shelf! It has a 3" drop and is 54" long and is constructed of 1" square tubing. Left Ladies Glove Hand 12". This vinyl display stands by itself and won't crack, chip or fade. Right Ladies Glove Hand 12". This vinyl display stands by itself and won't crack, chip or fade. Left Ladies Glove Hand 15". This vinyl display stands by itself and won't crack, chip or fade. Left Mens Glove Hand 12". This vinyl display stands by itself and won't crack, chip or fade. Right Mens Glove Hand 12". This vinyl display stands by itself and won't crack, chip or fade. This elegant display hand is made of white plastic. It stands 16" tall. The long fingers have a luxurious and elegant quality that make for a unique visual display. Perfect for displaying jewelry or gloves. Ladies Right Display Hand 16.5"
Perfect for displaying jewelry or gloves, this elegant display hand is made of white plastic. It stands 16.5" tall. The long splayed fingers have a luxurious and elegant quality that make for a unique visual display. Ladies Left Display Hand 12.5"
Perfect for displaying jewelry or gloves, this elegant display hand is made of white plastic. It stands 12.5" tall. The long splayed fingers have a luxurious and elegant quality that make for a unique visual display. This set of three black velvet busts are a great countertop jewelry display for necklaces. Ladies Left Display Hand 13"
This elegant display hand is made of white plastic. It stands 13" tall. The long splayed fingers have a luxurious and elegant quality that make for a unique visual display. Ladies Right Display Hand 20"
Perfect for displaying jewelry or gloves, this elegant display hand is made of white plastic. It stands 20" tall. The long fingers have a luxurious and elegant quality that make for a unique visual display. Ladies Right Display Hand 14"
Perfect for displaying jewelry or gloves, this elegant display hand is made of white plastic. It stands 14" tall. The long splayed fingers have a luxurious and elegant quality that make for a unique visual display. Our 5 hook metal hat tree has a modern design with a black finish. Can display up to 5 hats. Great for table top displays. 8"H x 6"W x 10"L.
Shipping Notes: This item is longer than 48” and will prompt an oversize shipping fee. * Set come with 6 different size cubes. and 5 3/4"H x 4"W x 8"L (Largest). 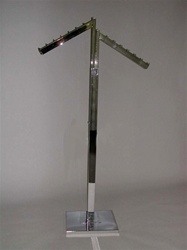 Raw-Metal Blouse Display manufactured from raw steel which is cut, welded, bent, fabricated and then given a protective clear coat. This creates functional fixtures while maintaining that natural look of gun metal gray. Matching Hat & Shoes Display are available to allow you to group these raw fixtures into an appearance of a custom look. 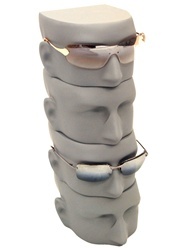 These split WhiteGray Sunglasses Display Faces are great for anyone trying to show off their stylish shades. Height: from top to bottom 4"
These split White Female Sunglasses Display Faces are great for anyone trying to show off their stylish shades. They stack nicely to display your eyeglasses. Comes in Package of Four and made in fiberglass. These split GunMetal Gray Female Sunglasses Display Faces are great for anyone trying to show off their stylish shades. They stack nicely to display your eyeglasses. Comes in package of four. Fiberglass construction. These split GunMetal Gray Sunglasses Display Faces are great for anyone trying to show off their stylish shades. Two Way Adjustable Garment Display. Our Black Matte Garment Display has 2 arms; 1 slanted and 16" long and the other straight and 18" long. 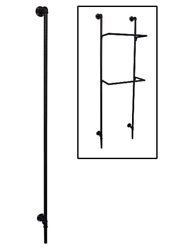 The slanted arm had 8 cube stops. The arms are made of 1/2" x 1-1/2" rectangle tubing . The upright tubing is adjustable every 3" from 52" to 73". 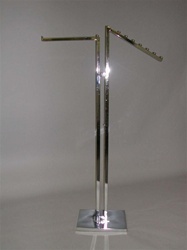 Includes a heavy-weight base, 12" x 15"
Cute Mini Mannequin for Jewelry Display in gloss white fiberglass. Nice way to show off earrings and necklaces. Arms out are 14" side to side, Mini mannequin height is 18" with a 5 inch round base. This matte glossy black female egghead head form is perfect for displaying hats, wigs, scarves, necklaces and much more! 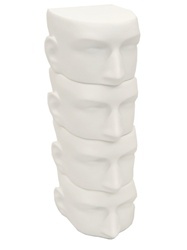 This sleek head form is unbreakable and features a neck that swivels from side to side. 2 Way Adjustable Garment Rack with Straight Arms. Our two-way rack is made of 1.4mm rectangular tubing in a satin nickel finish. Arms can be adjusted making the overall height adjustable from 49.642 inches to 70.642 inches. The base of the rack is 18.7 inches wide while the arms are 17" long. Two Way Adjustable Garment Display. Our Black Matte Garment Display has 2 arms; both slanted, 18" long with 8 cube stops. The arms are made of 1/2" x 1-1/2" rectangle tubing . The upright tubing is adjustable every 3" from 52" to 73". Includes a heavy-weight base, 12" x 15"
Adjustable Swivel Hang Bar mounts easily to the shelf clips within the Bronze Freestanding Merchandising Unit, which allows easy height adjustments. Orange or Black Rolling Z-Rack gives you the edgier look or displaying your clothes. Economy Z-Rack with Colored Base - Square Tubing - Features "Safety Orange" base. Ideal for use in showrooms and warehouses. Will nest together when not in use. Knocked-down construction - Z base comes in 3 parts that bolt together. Hangrail is made of 1-1/4" round tubing and measures 60 1/2" long. 4" industrial casters. 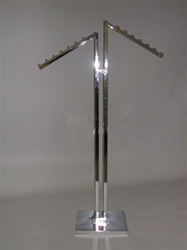 Our spiral garment rack comes in a satin nickel finish and measures 61.15" H x 18" W x 18" D base. The Pipeline collection is based on the traditional industrial grade clothing racks popularized in New York's garment center. This stylized and refined version incorporates interconnecting plumbing pipes and various plumbing connectors to give your store a great industrial look. Constructed of heavy duty 1 1/4" diameter plumbing pipe in shinny gray finish. Four Way Adjustable Garment Display. Our Black Matte Garment Display has 4 arms; each arm is 16" long and has cube stops. The arms are made of 1/2" x 1-1/2" rectangle tubing . The upright tubing is adjustable every 3" from 48" to 72". Four Way Adjustable Garment Display. 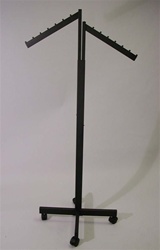 Our Black Matte Garment Display has 2 slanted arms; each arm is 18" long and has 8 cube stops. The 2 straight arms are 16" long. The arms are made of 1/2" x 1-1/2" rectangle tubing . The upright tubing is adjustable every 3" from 48" to 72". 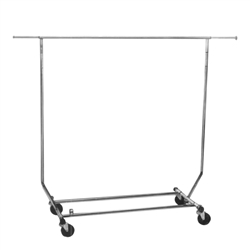 Adjustable Ballet Bar Garment Rack. 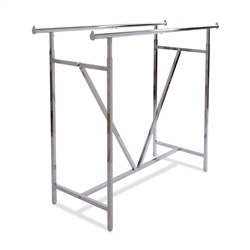 Our straight ballet bar clothing rack is made of rectangular tubing with a satin nickel finish. The top is adjustable allowing the height to adjust from 49.64" to 70.64". Salespersons Collapsible Rolling Rack - Heavy Duty Construction on 4" caster wheels ready to wheel around your items in style. 48" Long hang rail with 10" extensions that pull out for extra hand space as needed. Height is adjustable up to 65" tall. When done the rack folds up for easy transport and storage. Adjust in height up to 65"
Our White Slatwall Jewelry Display sits on your countertop. 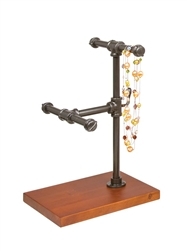 Rotates so your customers can see all of your fabulous jewelry. Assembly required. 12" x 12" x 15.3"
Our small acrylic display case is perfect as a countertop display for smaller items and accessories. Featuring six shelves and a locking door. Made of acrylic with a clear finish. 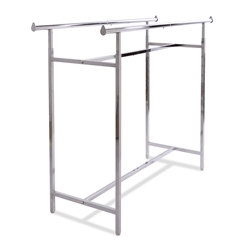 This double bar rack is height adjustable and features a chrome finish. Hangrail height is adjustable every 3" from 49" to 70"
Teardrop end caps are made for use with matching add-on hangrails. Capture last minute sales at the POS counter with this four way spinning wooden slat wall countertop display, perfect for all your smaller accessories like jewelry, sunglasses, candy etc. High Quality Fine Linen Size 8. Pinnable Surface (covered by fine linen, and multi-layer padding underneath.) Round wooden base included. Perfect for unique and interesting countertop display. Capture last minute sales at the POS counter with this four sided spinning wooden slat wall countertop display, perfect for all your smaller accessories like jewelry, sunglasses, candy etc. HEIGHT ADJUSTABLE: 48" - 72"
High Quality Fine Linen Miniature Size 6. Pinnable Surface (covered by fine linen, and multi-layer padding underneath.) Round wooden base included. Perfect for unique and interesting countertop display. 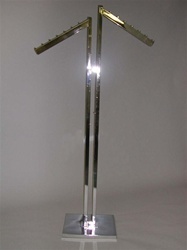 Set up your upscale boutique with these great looking Satin Chrome clothes display fixtures. 2 Way Adjustable Garment Rack with Straight Arms. 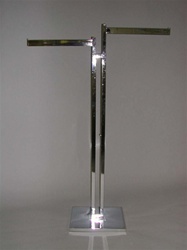 Our two-way rack is made of 1" X 1/2" rectangular tubing in a satin nickel finish. Arms are adjustable making the height adjust from 49.65" to 70.65". Base is 33" wide. Arms are 17" long. 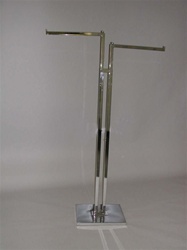 This double bar rack is height adjustable, features a chrome finish and a reinforcing V-brace in the center. 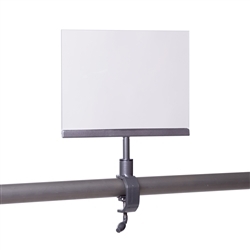 Upright is 1" x 3"
Nice white 12"x 12" Slatwall Spinner 54" Tall. Slats are 3" on Center. Base Height is 6" tall. Spinner rotates. Ships knocked down so assembly is required at your shop. Slatwall spinner is available in white, maple, and black. Click here to see all three colors of our 12"x 12" Slatwall Spinners at 54" Tall. Nice maple 12"x 12" Slatwall Spinner 54" Tall. Slats are 3" on Center. Base Height is 6" tall. Spinner rotates. Ships knocked down so assembly is required at your shop. Slatwall spinner is available in white, maple, and black. Nice Black 12"x 12" Slatwall Spinner 54" Tall. Slats are 3" on Center. Base Height is 6" tall. Spinner rotates. Ships knocked down so assembly is required at your shop. Slatwall spinner is available in white, maple, and black. 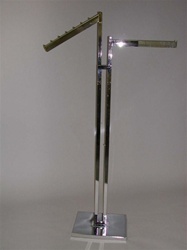 4 Way Handbag Square Tube Rack 8 Waterfall 5 Hook Arms. 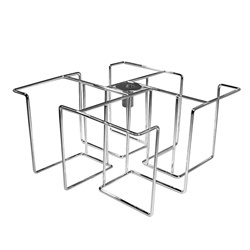 Our four-way rack is made of square tubing with a chrome finish. Includes 8 waterfall style arms with 5 hooks on each arm. 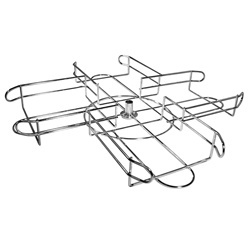 This 2-way hang rail rolling rack has an industrial chic look. 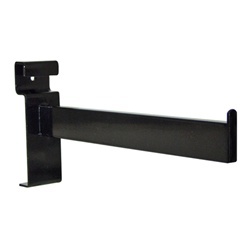 Made of black 1" pipe bar with a T shape, it is adjustable from 46" to 84" in height. Includes caster wheels for easy transport. Rolling Merchandiser- rack frame made of 1" square tubing with matte black finish, 8 shelf brackets and 4 white shelves and casters all included. * 14" Wide x 73" High. * 18" x 22" Base Unit. 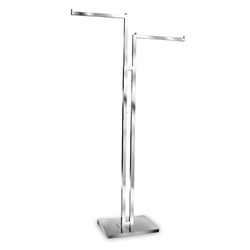 Pipe Collection clothing fixtures provides that edgy contemporary look in your store. Adjusts from 44" - 72" in height. Base: 21"W x 21"D with 13" Faceouts. Constructed of heavy duty 1 1/4" diameter plumbing pipe in anthracite grey finish. 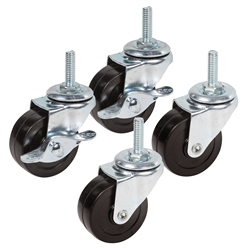 Includes four 2" casters, 2 locking, 2 non-locking. Adjust Height: 48" - 72"